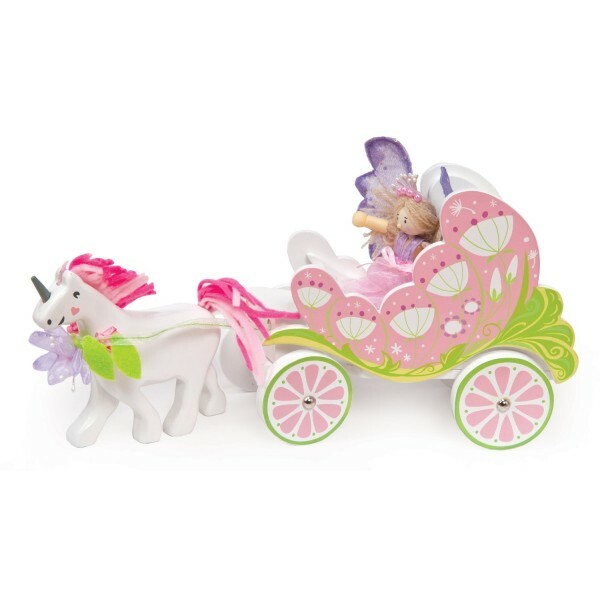 Saddle up for an enchanted carriage ride with this wonderful Fairybelle Unicorn Carraige from Le Toy Van. A stunning painted wooden fairy carriage in pink and winter snow white pulls the beautiful Fleur the Fairy through the magical kingdom, complete with a beautiful detachable unicorn in harness. Exquisitely crafted in wood, the carriage is attached to the unicorn by a ribbon with flower embellishments on the reins. Fleur the Fairy is wearing her very best pink ball gown, with purple fairy wings and a beaded sparkling crown. This is a stunning play set, with striking attention to detail and an eye for style, that plays beautifully and then looks equally amazing on any bedroom shelf. The wonderfully beautiful Unicorn detaches from the carriage, so the Fairy can even go for a freestyle ride if she wants. The set comes packaged in a clear fronted gift box, so the set makes an amazing gift for any little Fairy Queen.